Yesterday, in the first part of the new Boot Animations series here at AP, we posted 5 boot animations that replace those boring stock snoozers your carrier ships your Android phones with. One of the animations, called N1Bios, showed a BIOS boot screen so nostalgic to all PC owners, customized with some Nexus One info. 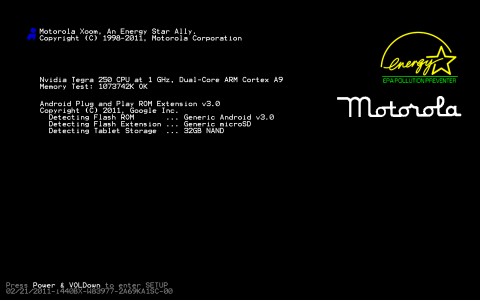 Yesterday, xda member ihtfp69 created something similar for the Motorola XOOM, complete with XOOM system specs, the word Motorola, and an ASCII Android logo.